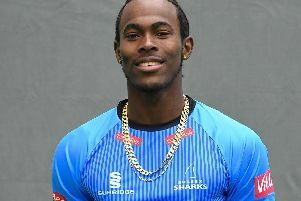 Sussex Sharks host their first Friday night NatWest T20 Blast clash of the 2015 season tomorrow when they take on Middlesex at The BrightonandHoveJobs.com County Ground, Hove (7.00pm start). Having won two out of three of their matches so far, the Sharks are in a healthy third spot in the South Group table following the home win against Gloucestershire and an impressive five-run victory over Somerset at Taunton last Friday. A second successive Man of the Match award for Will Beer, as he claimed figures of 3 for 23, helped Sussex to seal victory after Luke Wright (49), Chris Jordan (37) and Mahela Jayawardena (36) had all starred with the bat. Jimmy Anyon, Lewis Hatchett, Matt Prior, Ajmal Shahzad and Ashar Zaidi all remain sidelined for the Sharks. Matt Machan and Michael Yardy are included in the squad and face fitness tests on their calf injuries, whilst Jordan is in the England squad for the Second Test against New Zealand. Middlesex, who Sussex have beaten in six out of their last seven meetings in this format, can welcome back England’s limited-overs captain Eoin Morgan to their squad following his stint in the IPL. The match is sponsored by Cordery Coach, Sussex’s Official Coach Travel Partner and we thank them for all their continued support. Chris Nash, Stephen Piolet, Ollie Robinson, Luke Wright (c), Matt Yardy.